What’s going on with myON in our community? myON is the world’s largest interactive digital library with over 8,000 books. United Way brought myOn to seven schools and it was so successful Brevard Public Schools expanded the program. 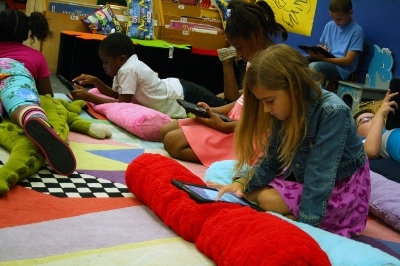 Since that time, Brevard students have read more than 1.5 million digital books! myON knows kids individually — age, interests, reading level, books they’ve read, and suggests other books they might like, at their reading level. Kids have 24/7 unlimited, anytime, anywhere access, available on desktops, laptops, tablets, and mobile devices. Students have access to thousands of books from over 26 publishers—70% nonfiction and over 10% Spanish. •Benchmark tests assess reading growth. Through these assessments, reports illustrate reading level, time each student spends reading, quiz results and benchmark scores. Students can track their reading growth through a trajectory report and educators can compare students to the class and district goals.